I am really excited about this book. It’s been on my to-read list for a long time and I am soooo glad I finally had a chance to read it! Cinder is–as you may expect–a re-imagined telling of the traditional fairy tale Cinderella. 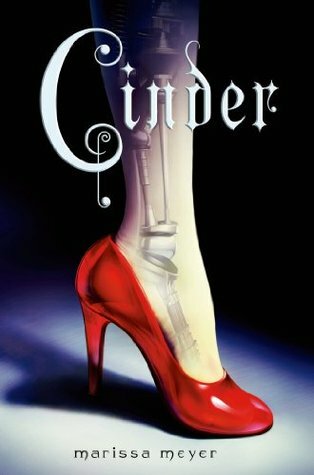 The book opens with Cinder digging a screwdriver into her ankle and her foot dropping loose, wires hanging from the remaining limb. Yes, in this version Cinder is a cyborg living in New Bejing, 400 years after World War IV. The stepmother is instead, the widow of the man who adopted Cinder–orphaned in a plane crash during which parts of her body were damaged so far beyond repair that they were extensively replaced with the cyborg implants. In this new society cyborgs are property so Adri is really her guardian (as opposed to having the “stepmother” title). Adri does have two daughters (the traditional “stepsister” roles). The elder of the two, like Adri’s character, stays true to the ‘cruel’ stereotype of the traditional story. The younger sister Pearl, however, has a loving relationship with Cinder. Cinder is a talented mechanic with a small shop in the marketplace. Her work supports Adri and her daughters–although all money goes directly into Adri’s account, to which Cinder does not have access. The ‘handsome prince’ character comes to life in the person of Prince Kai, whose father the Emperor is suffering from the pandemic known as ledimosis at the same time the people of New Bejing are attempting to sign a Peace Treaty with the people of Luna (the Moon). The Lunar people are feared and despised by those on Earth and their ruler, Queen Lavanna, is rumored to be an evil, merciless tyrant. The blend of traditional fairy tale form with the cyborgs, robots, hovercrafts, ID chips and intergalactic politics of science fiction/fantasy is masterfully done. Is the plotline predictable? Yes. But then again, it is supposed to be: it is a re-telling of Cinderella. Having a pretty good idea where this story will end up takes absolutely nothing away from the journey between the beginning and the end. Cinder is the first in The Lunar Chronicles and I have already purchased my copy of Book 2 (Scarlet–retelling of Red Riding Hood, with an eye on Book 3: Cress). I think Cinder is BRILLIANT and highly recommend it as a fun, enjoyable sometimes riveting–no pun intended–read that successfully weaves traditional storytelling with contemporary issues and style. I LOVED IT!